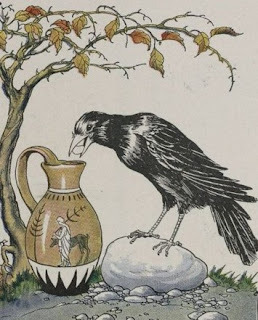 Aesop told the fable of a thirsty crow that came upon a nearly empty pitcher of water and discovered that by dropping pebbles in, he could raise the water to a drinkable level. The moral is "Little by little does the trick"--or was that "Necessity is the mother of invention"? Either way, scientists have enjoyed testing non-fictional members of the clever corvid family with this puzzle. Most recently, wild crows showed scientists they're smart enough for a whole barrage of Aesop-inspired challenges. 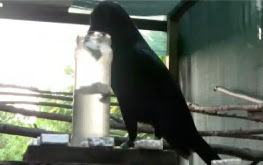 New Zealand psychologist Alex Taylor led the study of five New Caledonian crows that had been captured from the wild. The birds (Caesar, Laura, Bess, Mimic and Pepe, since you asked) were each given an extensive series of tests while visually separated from their peers. Like one of those computer games where you walk into a dead-end room and have to find the secret button that opens a submarine hatch and takes you someplace more interesting, the crows were presented with varied apparatuses and had to figure out which objects were tools that would help get a tasty treat into their beaks. 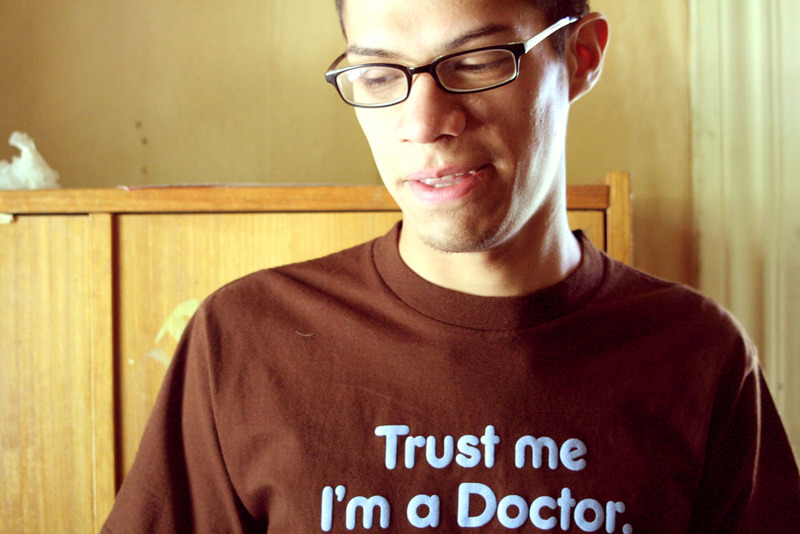 The tests began with the classic "Aesop's fable paradigm." Crows saw a tube partially filled with water. Inside the tube was a bite of meat, stuck onto a piece of wood that floated below their reach. Small stones were sitting nearby. If you're thinking that you might not have been able to solve this puzzle, rest assured--the birds didn't get it either. After making sure the crows didn't naturally know how to solve the puzzle, the researchers gave the birds a hint. This time, the crows saw the same tube, floating meat, and stones. But there was a platform next to the top of the tube with a couple stones sitting on it, too. As the crows attempted to jam their beaks far enough into the tube to reach the meat, they tended to accidentally knock the stones into the tube. After doing this several times and noticing how the water level rose, all the crows eventually figured out the trick. They began dropping stones into the tube on purpose to get the meat. Although this looks pretty clever, it's possible that the birds found the solution by simple association: "Stones mean food. Mess around with the stones, or put them near the food, and the food gets in my beak." So the researchers followed up with a series of puzzles that tested what the crows actually understood. In one test, the crows were given stones of two different sizes. They quickly began ignoring the smaller stones in favor of larger ones, which raised the water level faster. (Laura, the smartypants of the bunch, never once used a small stone.) In another test, the stones were replaced with white chunks of rubber and styrofoam. Though they looked the same, the former item was heavy and useful, while the latter uselessly floated on top of the water. Again, the crows picked up on the difference, learning after a few trials to discard the styrofoam chunks and throw the rubber ones into the tube. In this video, you can see Mimic mastering the puzzle on his first try (and adorably peeking into the tube to make sure the meat is still there). The crows seemed to understand what was important about the objects they were using as tools: bigger and heavier items would get the meat to them faster. But did they grasp what was happening inside the tube? To test the birds' understanding of the water in the tube, researchers showed them a tube of water next to a tube of sand. Both had the usual chunk of meat sitting on their surface, but throwing rocks into the tube of sand would accomplish nothing. The crows soon learned this, more or less, and dropped most of their rocks into the water tube. In this video, smartypants Laura ignores the sand tube entirely in her fourth trial. When the tube of water was paired with a tube of air, the crows again learned to put most of their stones into the water tube--though they dropped a fair number of stones into the air tube as well, apparently struggling to grasp that one clear substance wasn't the same as the other. New Caledonian crows use sticks as tools in the wild to dig grubs out of holes, and showed here that they can learn to use other kinds of tools as well. This suggests that using tools, for the crows, is true problem solving and not just an ingrained behavior (like your dog kicking up imaginary dirt on the sidewalk after it poops). And the birds' performance with different sizes and shapes of "rocks" shows that they can adapt their tool use to various conditions--though they did struggle a bit with the tubes of air and sand. Buoyancy is tricky for everyone. With the crow-and-pitcher paradigm nearly exhausted, maybe scientists will turn to Aesop's other fables for future studies. Are crows susceptible to flattery when holding pieces of cheese? Do foxes eat grapes (sour or otherwise)? And, of course, does slow and steady really win the race? I love how birds look at stuff. Adorable!